The Spiderwick Chronicles, the first great movie of 2008, is an astounding fantasy that arouses your attention from the very beginning. 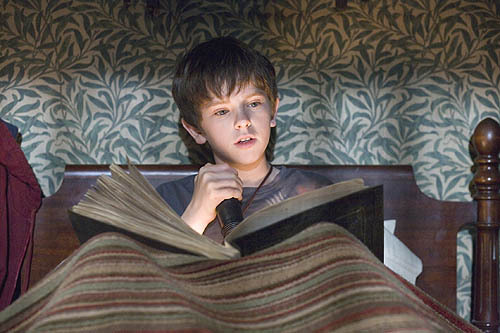 Jared (Freddie Highmore) is upset that he is moving to a new town with his two siblings and his mom. The house they are now living in was owned by Jared’s great-great-uncle, Arthur Spiderwick. Jared finds his way to the attic and comes across a book called A Guide to the Fantastical World Around You, a book by Arthur about the creatures around us that we cannot see. This opens up a whole new world to the characters and ourselves. What makes the movie so special other than the great effects is its attention to character. Each person, even creatures, acts out of character and personality, not plot contrivances. Also, credit must be given to both Seth Rogen for providing the voice of Hogsqueal and David Strathairn, who is perfect as Arthur, resembling the crazy guy he plays in City of Hope. In this story, nothing happens inexplicably. The movie has its rules, and they’re followed through and through. It’s very fitting that one of the trailers before the film was for the new Indiana Jones movie. The film is exciting, fun, and enthralling kids fare, like the first time I saw E.T., My Neighbor Totoro, or Millions. And it’s a breathtaking theater experience, so don’t wait for it to come on DVD. The Spiderwick Chronicles is a masterfully written, beautiful movie with powerful lessons for children. As a note for any skeptics, it’s more Pan’s Labyrinth than Bridge to Terabithia, but it has traits of both. The film can be a little dark at times, but it also swept me up like a child and made me feel like a kid again.